An engine-room is unlike anything in land architecture. It is an immensely tall space—reaching from the top of the ship, more or less, to the bottom. Huge. But, unlike most large architectural spaces (except perhaps Hell), you enter it through a small door at the top. The stokehold (or fire-room), which you enter at the bottom ordinarily, through a low door from the bottom of the engine-room, is a very different place. The air here is hotter still; but quite dry. Here, moreover, is a symmetry more like that of land-architecture: a row of similar furnaces, small at the bottom and growing larger above, so that overhead they come together, like gothic arches in a metal crypt (or the walls of a room in a dream). These passages call our attention to a subtle difference between “land architecture” and “land-architecture.” These two terms identify something we are all familiar with (buildings), and yet it is the use of a hyphen that really merits our attention. In the first excerpt, the words “land” and “architecture” are unconnected: they are separated both physically and conceptually. If architecture is different than land, then the engine-room is different from any kind of building we may be familiar with. With the second passage, however, the hyphen joins “land” and “architecture.” This is more than just a typographic connection. Here, it is as if buildings were literally connected to the earth. This gesture evokes such terms as site, location, and even context—all expressing different ways in which buildings become part of something else. History may even be the very thing that connects “land” and “architecture.” Notice how Hughes describes the engine-room’s stokehold as “symmetrical,” an attribute that immediately brings to mind the symmetric plans of classical or Beaux-Arts architecture. If the stokehold is “more like” a building, then equating its furnaces with “gothic arches” is another deliberate architectural description. Yet what connects these two descriptions are the parenthetical asides. In the first, the engine-room is “Hell”; in the second, “walls of a room in a dream.” These are architectural ideas, and thinking of a ship as architecture is enough to make it so. Admittedly, this all amounts to a fair bit of hair-splitting. We may even excuse the narrator for any errors of judgment or observation he may have made. This is, after all, neither an architect nor a historian, but a novelist that is making these equations. Yet this interest in equating the design and making of ships with the design and making of buildings is not foreign to the history of architecture. Nor is it foreign to the history of the history of architecture. Enter Julien-David Le Roy. As an architect, archaeologist and historian, Le Roy (1723-1804) is credited with creating a dualist approach to history that lingers to this day. Think of this approach as one that views the same building under two separate lenses—one historical, the other architectural— and that can yield different results. This was no doubt a reflection of Le Roy’s own curious upbringing. As a student at the prestigious École des arts under Jacques-François Blondel, Le Roy inherited a very rigorous background in architecture history. Upon finishing, he received the prestigious Prix de Rome in 1751. 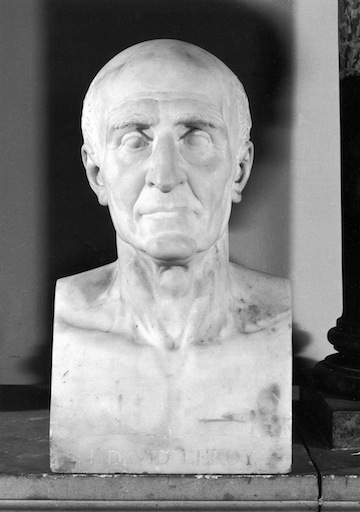 While there, he undertook an exhaustive and systematic study of Greek ruins, and went to Athens, Corinth and Sparta in 1754 to study more examples. 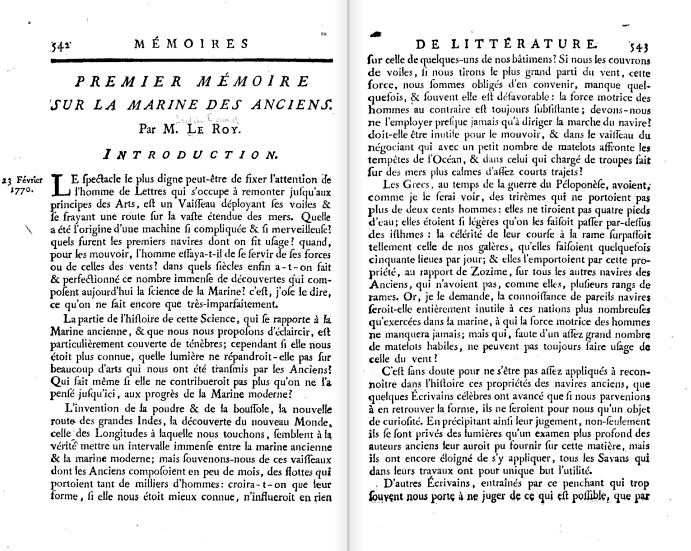 In 1758, he published Les Ruines des plus beaux monuments de la Grèce (Ruins of the Most Beautiful Monuments of Greece), his account of his travels to Italy and Greece. Part travel monograph, and part history of the region, Le Roy’s book featured picturesque compositions along with measured drawings of details and examples of Greek architecture. Others have remarked already that these two kinds of drawings represent the dualist approach I alluded to earlier: whereas the more picturesque drawings sought to situate a particular ruin within a historical context, the measured drawings represented an understanding of architecture through abstract and formal differences. This latter approach has been touted as an example of a “scientific” approach to the history of architecture. (Le Roy is often credited as being the first to apply Enlightenment ideas about science to the writing of architecture history). That is, Le Roy’s formal studies of Greek architecture were an attempt to deduce examples from general, original forms he called ideés. It perhaps should not surprise the reader that Le Roy also came from a distinguished family of watchmakers. Clocks, after all, were more than just metaphors describing the order of the universe; they were mechanical technologies that implemented order and structure to those phenomena that eluded description. In other words, clocks were regulators of chaos. They were highly rational machines that provided form. 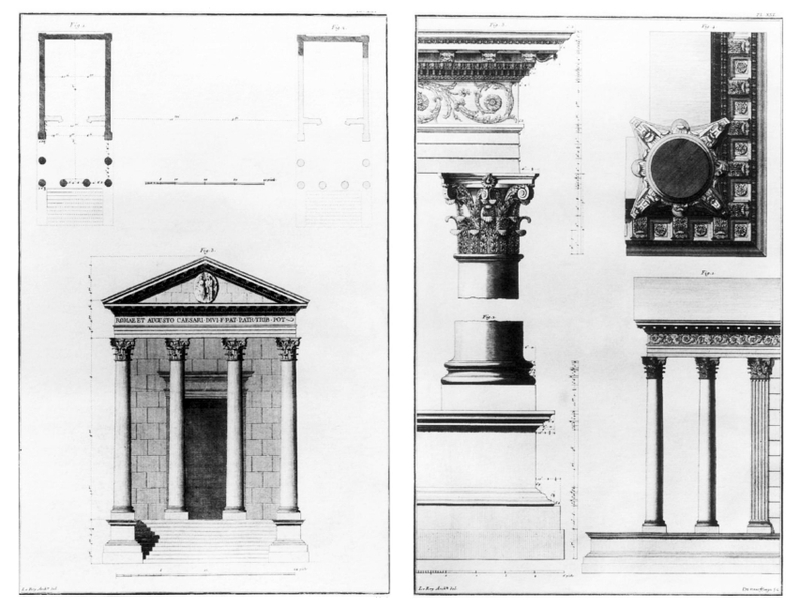 (Left) Plan and Elevation of Temple of Istria at Pola, from Julien David Le Roy, Les Ruines des plus beaux monuments de la Grèce (1758); (Right) Details of Temple of Istria at Pola, from Le Roy, Les Ruines. Both engravings by Le Bas (Source: Jeanne Kisacky, "History and Science: Julien-David Leroy's "Dualistic Method of Architecture History," Journal of the Society of Architectural Historians, Vol. 60, No. 3 (Sep. 2001), 264. Le Roy was a young architect who busied himself by expanding his world view. Worldly travels were becoming essential to architectural training, and this meant booking passage on vessels throughout Europe and the Mediterranean to visit those sites which were of historical importance. Le Roy was following in the footsteps of Antoine Babuty Desgodetz (1653-1728), who also traveled to Rome to make measured drawings of ruins and buildings from antiquity. Desgodetz’s experiences as an architectural traveller are remarkable: during his 1674 trip to Rome, Ottoman pirates captured and overran his ship. He and his companions, Jacob Spon and Augustin-Charles d’Aviler, were kept as slaves in Algiers and Tunis for a year. Jean-Baptiste Colbert, the Minister of Finance under Louis XIV and a tireless advocate of building up the French merchant fleet and armada, later arranged for a prisoner exchange. Once Desgodetz returned to Rome, he began the series of drawings that would become part of the influential Les edifices antiques de Rome dessinés et mesurés très exactement (The Ancient Buildings of Rome, Accurately Measured and Delineated) (1682). Like engraved books, ships were important mechanisms for conveying information about the ancient world to larger audiences. They were mediums of exchange between the modern and ancient worlds. This would take on an additional significance for Le Roy. After the successes of Les Ruines, as well as subsequent books on the history of ecclesiastical architecture, and following his appointment to the Académie Royale d’Architecture and the Académie des inscriptions et belles-lettres, Le Roy began to turn his attention to ships. In 1786, he became an advisor to Académie de marine in Brest and even proposed designs for a national school of maritime studies in 1794. These were all formative moments in an already illustrious career. Yet Le Roy’s project of articulating simultaneous historical and scientific approaches to history had reached their fullest expressions by 1770 and 1777 in three works that were not about buildings, but about ships. The first of these was “Mémoires sur la marine des anciens” (“Memoirs on the navies of the ancients”), Le Roy’s first lecture on naval architecture. Presented at the Académie des inscriptions et belles-lettres in February 1770, this lecture presented analyses and detailed explanations of the evolution of ships and sails to demonstrate that the historical and scientific approaches had to work in tandem. In Le Roy’s words, history and nature were similar: “History, as much as nature, frequently offers us a mass of sterile facts; she also sometimes presents us with some more precious, but more rare facts, from which can be drawn, as from a prolific spring, a great number of truths.” History and nature both yielded the ever-important principles needed for scientific understanding. Without a historical underpinning, a technical understanding of ship building would be faulty. The same applied to history of naval architecture: it made little sense without understanding the kinds of technological changes that gave rise to the present problem. And like Les ruines, Le Roy’s first work on ships identified the development of an idée over time. The only difference here, of course, was that he looked to examples from Phoenician, Greek, and Roman shipbuilding to prove his point. 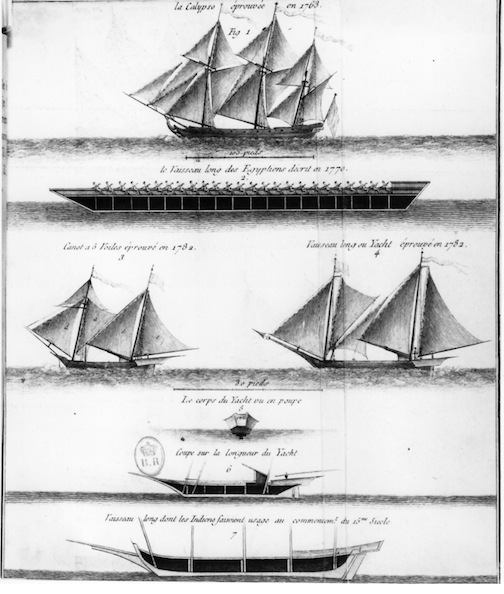 Catherine Haussard, engraving showing historical development of vessels. Figure 3 represents Odysseus' raft. Figure 4 is a Phoenician vessel. Figures 5 and 6 are the side and front elevations of an Egyptian ship. From Le Roy, "Premier mémoire sur la marine des anciens,” 596. Le Roy’s use of images, begin to demonstrate how these two methods were at first separated. 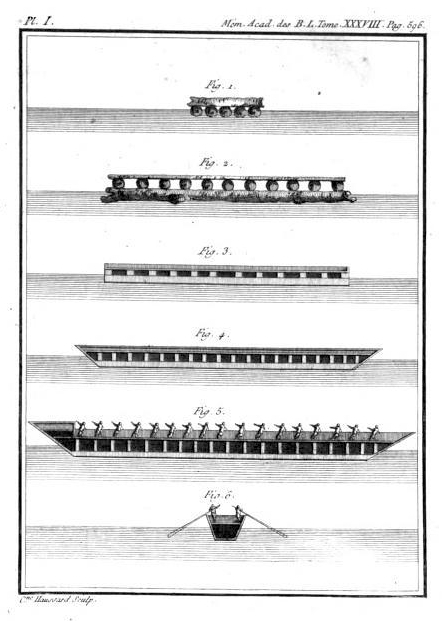 The most famous of these are the set of engravings (drawn by Catherine Haussard) showing the development of vessels based on the idée of a single-person raft. At the top, an elevation shows a flat piece of wood supported by wooden logs. Underneath, the complexity of the vessel increases progressively according to the number of oarsmen and passengers, showing Odysseus’ raft, a Phoenician long ship, and culminating with an Egyptian vessel. Another engraving shows the further development of rowing vessels, focusing on the idée of a ship comprised of a single line of rowers. Yet the emphasis is geographically-specific. Here, Le Roy focused on how Greek designers modified ships in order to accommodate larger numbers of rowers. 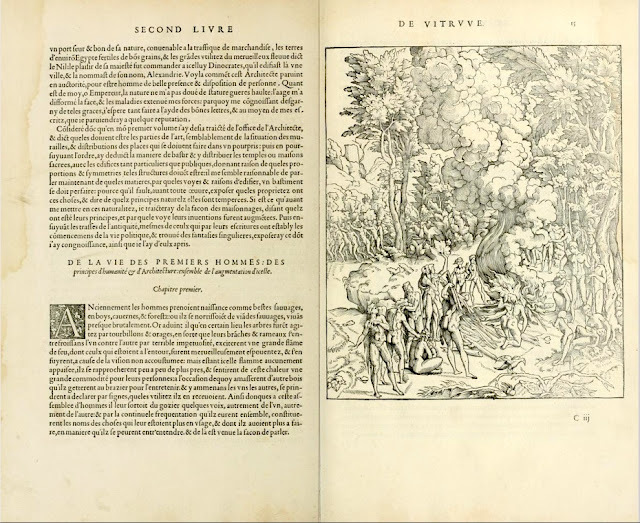 Whereas the first engraving depicted changes in development according to technological innovations, the second focused on a specific historical context. In his third text on ship design, Les navires des anciens (The Ships of the Ancients) (1783), Le Roy begins to conflate the two approaches. Again, it is an engraving that gives a visual expression to this method. Here, the focus is on the development of sails, showing the development of Carthaginian, Greek, and Roman ships as part of a singular historical procession. The unifying principle here is the shape and arrangement of the sail as it leaps periods and geographies by dint of the engraved image. It is an image that underscores faith in reason, for only through the application of scientific reasoning could such an image be created. But in order to get a sense of how all of this came to be, of why ships should even be subjected to the same kind of analysis as buildings, it is important to look at Le Roy’s second text on ships, La marine des anciens peuples (The Navies of Ancient Peoples) (1777). Engraving by Jean Goujon of the Vitruvian origins of fire as shown in the first French translation of de Architectura. From Jean Martin, Architecture, ou Art de bien bastir de Marc Vitruve Pollion Autheur (Paris, 1547). And when furious rains and winds occurred, the trees in Tyre were rubbed against each other and caught fire, and burnt down the wood that was there. And Ousous took a tree, and, having stripped off the branches, was the first who ventured to embark on the sea. Hurricanes (said Sanchuniathon) having burst all at once upon the trees of the forest of Tyre, which caught on fire, and the flames devoured the forest. In this confusion, Ousoüs took the trunk of a tree, and having de-limbed it, he first ventured out to sea. A tempest, on a certain occasion, having exceedingly agitated the trees in a particular spot, the friction between some of the branches caused them to take fire; this so alarmed those in the neighbourhood of the accident, that they betook themselves to flight. The “flight” here leads to the first gathering of people around a fire, which leads to the creation of the first shelters — the origin of architecture. Yet Le Roy’s reading of Sanchuniathon gives a more important significance to storm at Tyre. The very hurricane that gives birth to seafaring becomes the storm that gives birth to architecture. This was by no means a strange way to look at the historical relationship between ships and buildings. In La marine, Le Roy also mentions in a footnote Goguet’s description of large seaborne rafts known as "pyrogues" as “that other kind of building.” By the time that Le Roy published his treatises on naval architecture, "bâtiment" was commonly understood to refer to both "ship" and "building." But as Le Roy noted, thanks to Vitruvius replacing Ousous’ wooden raft with a shelter, we can now locate the origins of architecture in seafaring. The ship was the very first architectural object. The Calypso, shown alongside other vessels with ancient riggings. 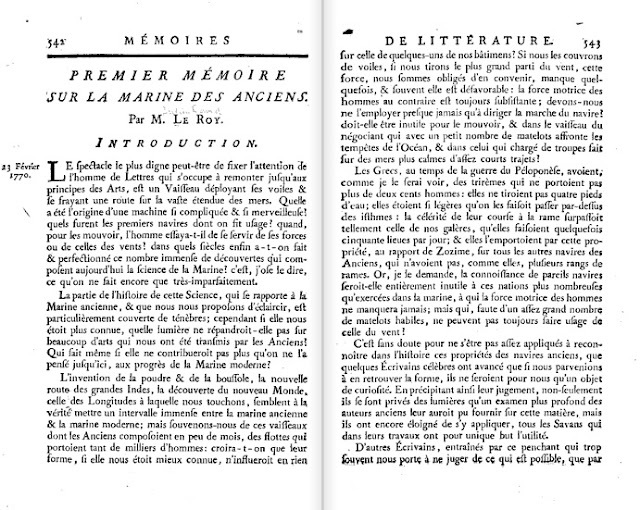 From Le Roy, Nouvelles recherches sur le vaisseau long des anciens, sur les voiles latines, et sur les moyens de diminuer les dangers que courent les navigateurs (Paris, 1786) (Source: Sylviane Llinares, “Marine et anticomanie au xviiie siècle: les avatars de l’archéologie expérimentale en vraie grandeur,” Annales de Bretagne et des pays de l’Ouest, Vol. 2, No. 115-2 (2008), 25. Le Roy believed in the study of ancient sources as a way to approach contemporary architectural design. The same could be said about his interest in ships. More than a historian of naval architecture, Le Roy also designed various ships and used his knowledge of seafaring from classical antiquity to design sails and riggings. This aspect of his career has meteorological origins as well. In 1763, the Minister of the Navy, the Duke de Choiseul, appointed Le Roy to test a new kind of sail based on ancient designs aboard the war frigate Calypso. These riggings, which used triangular instead of square sails, proved deficient when a strong storm overtook the Calypso and forced the crew to almost scuttle the ship near the English coast. Though crewmen were able to repair the ship, Le Roy would continue this aspect of his career. Besides testing additional sails and riggings on other naval vessels, he would design his own ship, the Naupotame, and engage in an prolonged letter exchange with Benjamin Franklin about the development of merchant fleets. This would reach its apex in a final series of texts, including one written in 1786, that concerned sail designs and the avoidance of marine hazards, and another, a small tract advocating for a system of deep canals that would connect Paris and the Seine to the sea. At 2 p.m. [November 5, 1932] the wind shifted to N.E. blowing with hurricane force accompanied by blinding squalls and a very high sea. The barometer was then falling rapidly reaching the low point of 914.6 mb. [27.01 inches] by 8 p.m. A fierce hurricane was blowing and a very high sea running. The ship was enveloped in spindrift, reducing the visibility to Nil, the No. 1 hatch not being visible from the bridge. The vessel was rolling heavily, the helm being of little use. So great was the force of the wind that shortly before 8 p.m. the funnel was blown overboard. The ship was rendered helpless and from then on was carried with the hurricane in an unmanageable state. It would not be overestimating to put the wind force at 200 miles per hour. Hatches were blown overboard like matchwood, derricks and lifeboats wrecked, upper and lower bridges blown in. The passage, with its account of chaos and destruction, seems to be undoing very description that introduced this post. If the Archimedes from Richard Hughes’ In Hazard is an example of a ship that can be equated with “land-architecture,” then this storm becomes the very force that “erases” the hyphen. Architecture becomes unmoored, cast adrift in a maelstrom. Later in 1932, after the Phemius was towed to salvage, its captain, D.L.C. Evans, asked Richard Hughes to write an account of the hurricane. He would eventually fictionalize the account, the result being one of the inspirations for In Hazard. And though the book’s descriptions of the storm are sometimes fantastic, their brute poetry give the 1932 hurricane an additional allegorical dimension. Hughes wrote the novel in in 1938, its chaotic whorls foreshadowing the ways in which the Second World War would ravage Europe and the rest of the world. Yet the hurricane from In Hazard is more than just an allegorical storm. As a meteorological event, it is the device that propels and structures Hughes’ narrative. It is, in other words, a form-giver, an elusive, chaotic event that nevertheless orders the world it consumes. To fully understand this, it is important to consider one final storm. 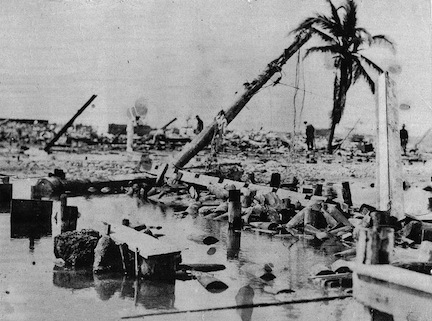 On May 24, 1885, a tropical monsoon cyclone formed near the Laccadive Islands, about 555 km southwest of the Indian peninsula. It traveled westwards and entered the Arabian Sea, making a direct line toward the Gulf of Aden. Yet neither the cyclone’s trajectory, nor its strength and magnitude were known until unverified and poorly-kept accounts from ships caught in the storm’s path began to appear in various newspapers. The storm would eventually make landfall on the Horn of Africa, and its immediate aftermath became well known. On June 3, the cyclone claimed five vessels—the German corvette Augusta, the French dispatch vessel Renard, the Turkish steamer Fetul-Bahari, and the British cargo ships S.S. Speke Hall and S.S. Seraglio—with no sign of cargo and at least 427 crew and passengers lost. It was not until 1886 when the first detailed accounts of the storm began to appear in official publications. For example, a report of the storm appeared in an issue of Annalen der Hydrographie und martimen Meteorologie, the German Hydrographic Office’s official journal. The article featured one of the first maps of the cyclone’s trajectory, based on information provided by the Indian Meteorological Office. That year also saw one of the most comprehensive and authoritative accounts of the cyclone. 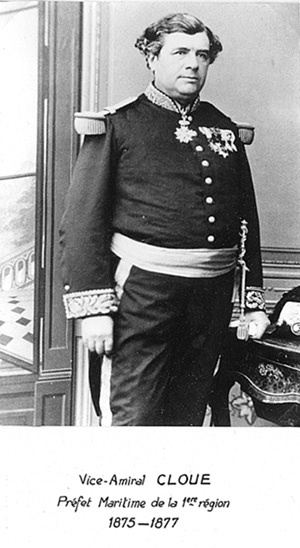 Written in March 1886 by Vice-Admiral Georges Cloué, the newly-appointed French Minister of the Navy and the Colonies, the article was the first of several reports for the French Navy compiling meteorological and navigational data from 27 vessels that were caught in the storm. Cloué’s studies featured numerous diagrams and maps that explained the strength of the storm in terms of the speed and orientation of winds. Of these, the most visually compelling are the diagrams that show the location of a ship in relation to the storm. Each is presented from a particular vessel’s “point of view.” The most basic diagram is that representing the storm as it passed over the French frigate Rouen, carrying a cavalry regiment from Tonkin in Indochina. 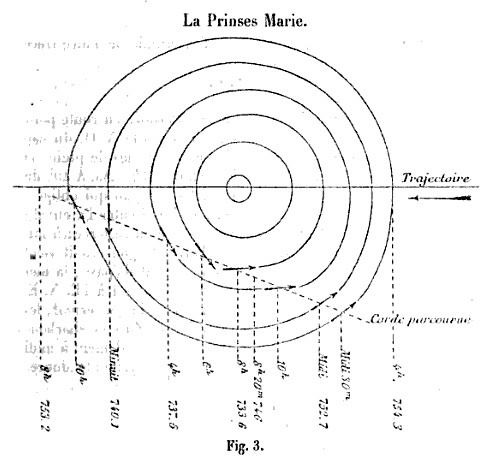 Here, Cloué calculated the cyclone’s direction and orientation by compiling wind speed, direction, and atmospheric pressure: these were drawn as a familiar cyclonic form, with a line in the middle representing the storm’s direction. This was a fairly straightforward, yet incomplete graphic. Though the center of the cyclone passed over the Rouen, the diagram did not show the ship’s position in relation to the storm’s. 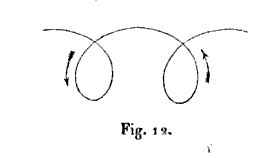 Cloué would achieve this subsequently with other diagrams depicting the storm’s trajectory as it would intersect with a ship’s, and in other instances, showing the cyclone in relation to two vessels. All of this information would be compared with data provided by manometers and anemographs posted on the Gulf of Aden by the British Royal Navy. Diagrams showing vessels in relation to the Aden Cyclone. From Vice-Amiral Cloué, “L’Ouragan de juin 1885, dans le Golfe d’Aden,” in Service Hydrographique de la Marine, Annales hydrographiques: Recueil d’avis, instructions, documents et mémoires relatifs à l’hydrographie et la navigation, Vol. 2, No. 8 (Paris: Imprimerie Nationale, 1886). Cloué’s studies, though carefully-researched and expertly-wrought, only foregrounded what was really at stake: the form and “design” of tropical cyclones. He called the very last section of his April 1886 article “Étude du cyclone” (“Study of the Cyclone”), and it purported to be just that: an investigation of the storm’s shape and form as it gained and lost strength. This was necessary. Cloué claimed that his report would improve on previous work on storms, which often relied on eyewitness accounts without corroborative data. Even more important was the fact cyclones rarely occurred on or near the Gulf of Aden. The Aden cyclone was not only unprecedented in terms of strength and destructiveness, it was rare. 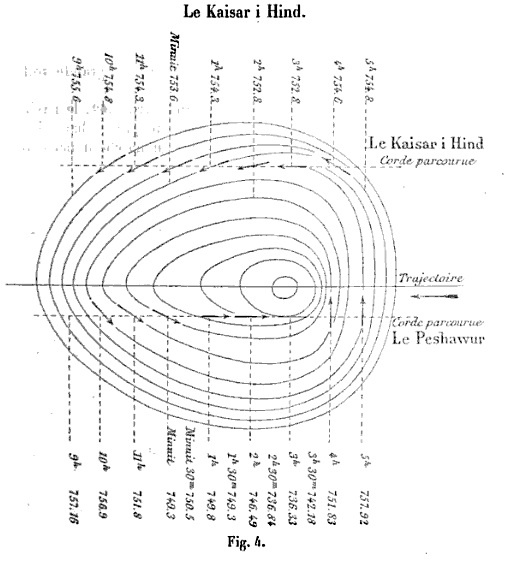 By comparing the previous drawings with sailors’ accounts, Cloué introduced a series of diagrams that give us a more familiar understanding of the shape and movement in a hurricane. He presents one describing the cyclone’s trajectory as a function of data provided by S.S. Duke of Devonshire and a weather station on Aden. The data was not only easy to obtain but also easy to interpret and showed that the storm traveled in a curlicue pattern along a line equidistant from both sources. Yet this was no mere trending line. 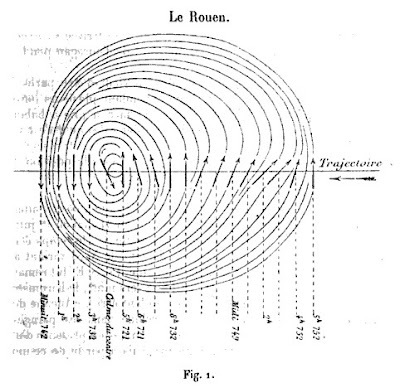 Cloué compared the Aden cyclone’s movements with those from other parts of the world, in short deducing the trajectory as a function of wind speed and pressure. These were just ways of expressing the importance of latitudinal motion to the Coriolis effect: the counterclockwise movement of fluids around a vortex in the Northern Hemisphere. Yet there was something about the storm that troubled Cloué. “Everything is excessive in a hurricane: the electric state, the sea completely upset, the wind, the wind above, irresistible, terrible! I can speak because I am a witness to one of these large and dangerous atmospheric disturbances, and the few details that I'm going to give to an event already thirty-nine years old are not irrelevant.” Here, the Vice-Admiral is speaking from experience. In 1846, Cloué was an officer aboard the war frigate Belle-Poule when it encountered a powerful cyclone in the Indian Ocean. Recounting the confusion and destruction brought about by the storm, he reminds readers that hurricanes are fundamentally unpredictable. Any attempt at understanding their composition or power is doomed to failure. Only a year after the Belle-Poule was nearly scuttled, another event would give Cloué’s observation some weight. 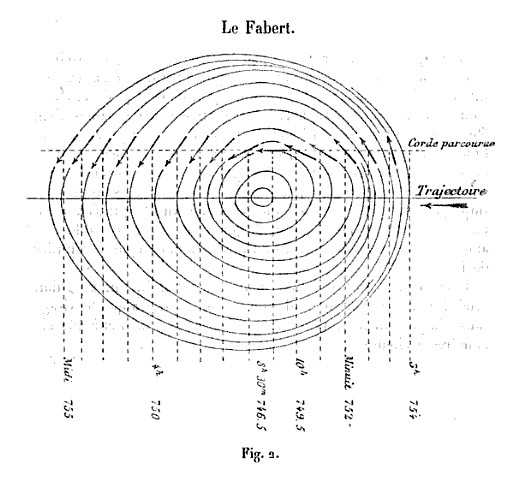 In 1847, the French mathematician Joseph L. F. Bertrand “popularized” the Coriolis effect in an article concerning “relative movement”— the perception of one object’s motion compared to an other’s. When applied to natural phenomena such as hurricanes, Bertand’s interpretation of the Coriolis effect resulted in two observations: first, that a storm would conserve its velocity as it traveled; and second, that the Coriolis effect alone was responsible for the movement of hurricanes. Cloué’s remark about knowledge that had been around since 1846 is poignant because by 1885, everything that there was to know about the Coriolis effect was known. 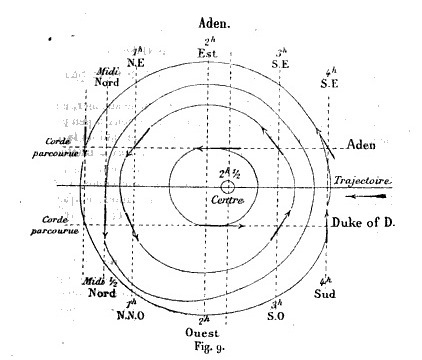 His observations about the Aden cyclone contradict Bertrand’s descriptions of the Coriolis effect. Energy was not at all conserved. Rather, Cloué noted that the Aden cyclone shrank in size as it gathered in strength until it slowed down and withered into nothing: “the mass of storm clouds was consumed by itself, and without further nourishment the cyclone ended like a simple waterspout.” More importantly, he stated that what caused the cyclone was not the Coriolis effect, but rather the collision between southeasterly winds and the easterly monsoon winds. He illustrates this with a drawing showing how the collision between these two winds could generate the counter-clockwise motion normally associated with the Coriolis effect in northern latitudes. The hurricane has become a central metaphor for this tale. Cyclones, tropical storms, and other meteorological aberrations are more than just phenomena that order and structure narratives; they are the very forces compelling one to write a literary or historical account. And yet a hurricane, whether described by Richard Hughes, Vitruvius, Eusebius, Le Roy, or Cloué, is that most illogical of objects, a kind of destructive disorder that can only be understood through various normative means of representation. As a series of lines that suggest a whirlpool, or a circle with watery arms that “spin” in a counter-clockwise direction, hurricanes are examples of what English physicist Michael Faraday called “lines of force.” These tell-tale lines, which proved the existence of magnetism, could not be observed. Yet when metal shavings were placed near a magnet, they “formed” lines that seemed to oscillate outwards. 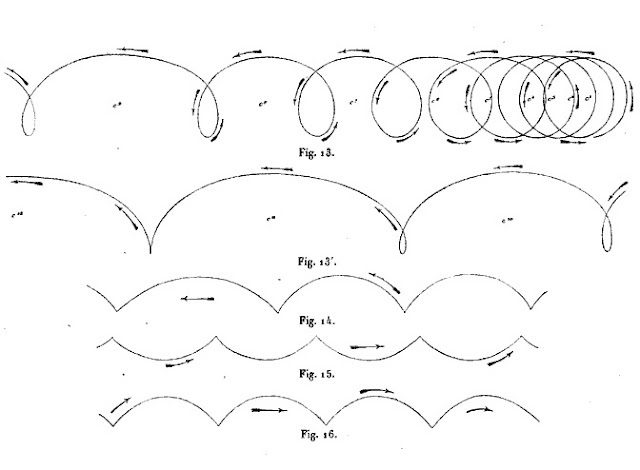 Like Faraday’s “lines of force,” Cloué’s whorls and curlicues confront and describe something that is known yet invisible. 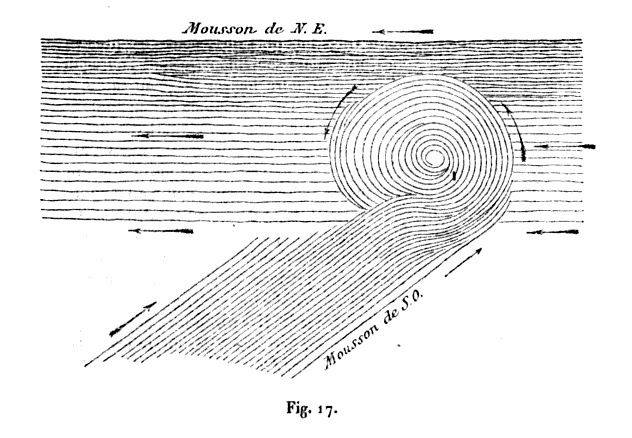 Yet what really separates the two is that, unlike Faraday’s accounts of magnetism, Cloué’s diagrams and descriptions of the Aden cyclone rely on conventional drawing techniques. Sometimes rough, other times meticulous, these drawings treat data in a sketch-like manner. They only aim to give a sense of a hurricane’s ideal, and not precise form. Returning to Le Roy’s treatises on naval architecture momentarily, we are reminded of how his combination of historical and architectural approaches could be combined in a single diagram. Like the example of sail and rigging development from Les navires des anciens, drawings could be use to convey both scientific and historical development. The same could be said of Cloué's analytical drawings of the Aden cyclone. Following the initial diagram showing the Aden cyclone’s curlicue path, a second image shows a progressive series of similar paths. Each of these changes shape with changes in wind speed and barometric pressure. Yet we are not looking at one storm, but several from different parts of the world. Some show the trajectory of winds in the Northern Hemisphere, others in the Southern. It is a diagram that is conceptually similar to the engraving from Le Roy’s Les navires showing the development of sails. As these showed the development of sails throughout history using examples from different eras, Cloué’s diagram abandons geographical specificity to demonstrate how a hurricane’s path develops over time. Yet the general principle that underlies Le Roy’s thinking—the tracing of the development of an idée over time—resonates with another aspect of Cloué’s work. In an 1887 article, Cloué introduced two maps, each showing the path of the cyclone as it moved from the Laccadives to the Gulf of Aden at a specific time of the day. The first is a reinterpretation of the German map that appeared in German hydrographic journals in 1886. It shows the storm’s trajectory, as told from the point of view of different vessels. The paths of four of these are depicted as dashed arrows, each showing the general path of a ship as it moved with or against the oncoming storm. Labeled dots indicate the threshold at which barometric pressure reaches the 750 mm isobar at a certain time and location. The thickest, blackest line belongs to the Aden cyclone itself, here shown as moving in a shallow sine wave-like pattern as it entered the gulf. Small dots show that the storm was increasing in size as it approached land. 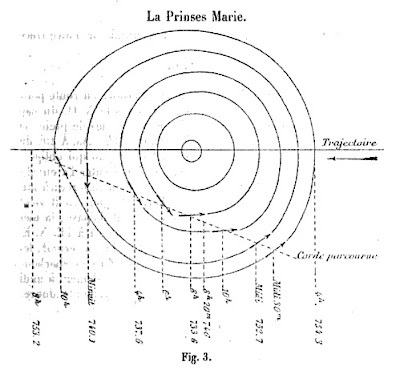 This depiction of the storm is different from that in the second map, a summary of Cloué’s own research about the event. Here, the cyclone’s progression appears as series of circles that diminish in size—this, of course, verifying his observation that the storm behaved “irregularly.” As in the German map, the resulting diagram here represents information gathered from various vessels. Yet the most important difference is that in the French map, the cyclone appears to be taking a rectilinear path. This is because, according to Cloué, cyclones tend to follow the “line of least resistance” once they enter a confined space like the Gulf of Aden. And after using additional accounts, Cloué concludes that the German report is erroneous. It is in this sense that much of the intellectual work behind Cloué’s 1887 article consisted of proving that, of all things, the cyclone behaved in a rational manner. The two maps then exemplify different kinds of knowledge. The German map, which relied extensively on wind change data to show differences in isobars as well as the position of the storm, exemplified a quantitative approach to meteorology that was being recuperated slowly. Cloué’s map, on the other hand, resonates with the kind of scientific thinking shown in the engravings from Le Roy’s Les navires. 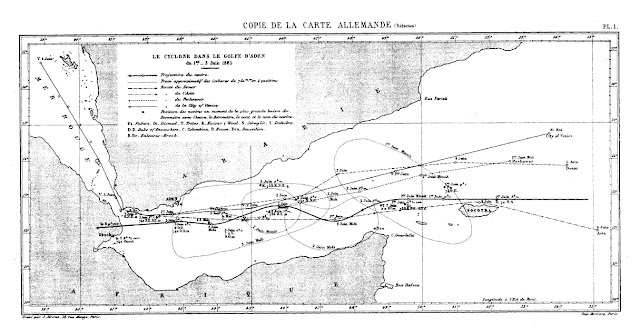 This map suggests that experience, in the form of the accounts from various vessels moored or traveling along the Gulf of Aden from May 31 to June 3, 1885, confirm the idea that cyclones travel in straight paths. The fact that the maps show the cyclone differently is also important. Whereas the German hydrographic map depicts the cyclone as a nebulous form that saunters along the Gulf of Aden, Cloué’s shows it as a circle—a convention that reflects the actual “position and extent” of the storm. Synoptic chart showing position of Aden cyclone relative to regional pressures. From W.L. Dallas, Storms of the Arabian Sea (Calcutta: Indian Meteorological Department, 1891) (Source: David Membery, “Monsoon Tropical Cyclones: Part 2,” Weather, Vol. 57, No. 7 (Jul., 2002), 247). Readers will no doubt find Cloué’s conclusions troubling, especially since the German map “looks” more exact than the French map. Yet more attention must be paid to not only the location of the cyclone in each map, but also to the lines which connect it as it travels up the Gulf of Aden. Because the German map considers the storm in terms of wind direction, it calls attention to four instances of sudden changes in orientation. The result is a map that shows the trajectory as a sweeping curve. It is, in some ways, reminiscent of the Indian Meteorological Office’s synoptic chart from 1891. 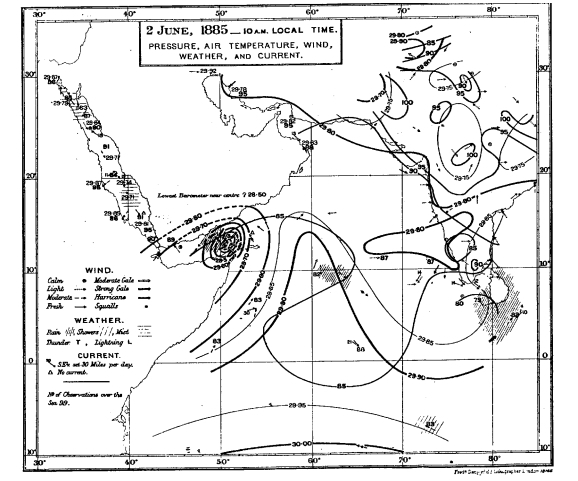 One of several authoritative maps published in various almanacs until about 1900, this chart shows the Aden cyclone in relation to the changes in isobars in the region on 3 June 1885. With Cloué’s map, however, the “line of least resistance” is just that: an unwavering line with a preordained trajectory. They are overly conclusive, but more importantly, they connect seemingly unrelated phenomena in the most efficient way possible. There is another way to read these lines. These are not lines of causality portraying how one event followed another in a logical sequence. Nor are these “lines of force” that suggest something that is understood yet invisible. The lines describing the Aden cyclone’s path are reminiscent of hyphens. As stated at the beginning of this post, a hyphen is a line that joins separate words to form a single, coherent idea. The hyphen also presupposes that the ideas are unrelated. But for a hyphen, we would understand “land-architecture” as different from “land architecture.” Yet hyphens and similar marks perform a more complicated operation than just connecting and separating. The hyphen, as understood in classical and medieval texts, was first used as a pronunciation aid and then as a device for correcting spacing errors. This must be distinguished from the trait d’union, a hyphen-like mark appearing around the tenth and eleventh centuries. The trait d’union ensured continuity in text through the separation of words. And through the separation of words, texts became easier to read. The trait d’union was therefore a representation of continuity. And like Le Roy’s ships or the Aden cyclone, the trait d’union was a kind of representation that reflected changes in geography and technology. It not only changed as printing technologies changed, but it was used in different ways according to the kind of text and location. Above all, both the trait d’union and hyphen are important because they are examples of devices or conventions that articulate the spaces in between words with lines. Space became a connector. Like a picture plane, the flat, two-dimensional surface of a printed page, synoptic chart, or hydrographic map became, as art historian Erwin Panofsky described it, a “spatial continuum ... which is understood to contain all the various individual objects." Cloué’s line of least resistance can be considered as such. It is not only evidence of a spatial and temporal continuum, but more importantly, it shows how the space in between the Aden cyclone’s various positions are imbued with meaning. [The wind] looks partly as if it were made of poisonous smoke; very possibly it may be: there are at least two hundred furnace chimneys in a square of two miles on every side of me. But mere smoke would not blow to and fro in that wild way. It looks more to me as if it were made of dead men’s souls—such of them as are not gone yet where they have to go, and may be flitting higher and thither, doubting, themselves, of the fittest place for them. A barometric low hung over the Atlantic. It moved eastward toward a high-pressure area over Russia without as yet showing any inclination to bypass this high in a northerly direction. The isotherms and isotheres were functioning as they should. The air temperature was appropriate relative to the annual mean temperature and to the aperiodic monthly fluctuations of the temperature. The rising and the setting of the sun, the moon, the phases of the moon, of Venus, of the rings of Saturn, and many other significant phenomena were all in accordance with the forecasts in the astronomical yearbooks. The water vapour in the air was at its maximal state of tension, while the humidity was minimal. In a word that characterizes the facts fairly accurately, even if it is a bit old-fashioned: It was a fine day in August 1913. These last words—”It was a fine day in August 1913”—not only operates as a satire on positivism, but also underscores one of the novel’s preoccupations: analytical passivity in the face of an oncoming global catastrophe. Indeed, all meteorological information may lead to the conclusion that it is a fine day in August 13, and yet the opening paragraph is one of the few emphatic statements of certainty in the novel. Everything unravels after this point, as it is made clear by the fact that the novel’s titular character, an Austrian mathematician named Ulrich, claims that he lacks unity and coherence. Like the Archimedes, or even Ousous’ raft, we seem to have drifted very far from the opening premise of this post: that ships were architecture. To avoid what may seem like a tacit fact, the narrative moved forwards and onwards, taking whorl-like detours and breezy tangents that tried to escape the centering premise, and yet managed to circle around it. To say that hurricanes are architectural is different than saying that hurricanes have a significance for the history of architecture. But is there really any other metaphor that encapsulates the historian’s task like a hurricane? Unlike Le Roy, our take on the histories of architecture and urbanism leads us to the inevitable conclusion that ours is a demanding and herculean task. Historical and technological accounts are only part of the information we much compile and assess. And much like Vice-Admiral Cloué, we compare this data with ephemeral or less-than-ironclad information to try to come up with an understanding that builds upon, elaborates, or even corrects previous accounts. To confront this situation, to give order to conflicting and confusing information, Cloué gave us the ideal form of a hurricane. And he did it in a most architectural fashion: as a rendering composed almost entirely of lines and space. Richard Hughes, In Hazard (New York: NYRB Classics, 2008 ), 5,6. One of the most succinct articles espousing this point is Jeanne Kisacky, “History and Science: Julien-David Leroy’s ‘Dualistic Method of Architectural History,” Journal of the Society of Architectural Historians, Vol. 60, No. 3 (Sep., 2001), 260-289. For more information about Le Roy’s writings, see Robin Middleton’s exhaustive introduction to Julien-David Le Roy, The Ruins of the Most Beautiful of Greece, Historically and Architecturally Considered, David Britt, trans. (Los Angeles: Getty Center Research Publications, 2004) as well as Christoper Drew Armstrong, “Progress in the Age of Navigation, The Voyage-Philosophique of Julien-David Leroy,” Unpublished Ph.D Diss, Columbia University, 2003. Later this summer, a version of this last work will be published as Christopher Drew Armstrong, Julien-David Leroy and the Making of Architectural History (London: Routledge, 2011). For excellent descriptions of how clocks became essential to the Western tradition, see Carlo M. Cipolla, Clocks and Culture, 1300-1700 (New York: Norton, 1977) and J. David Bolter, Turing’s Man: Western Culture in the Computer Age (Chapel Hill: University of North Carolina Press, 1984). Julien-David Le Roy, “Premier mémoire sur la marine des anciens,” Histoire de l’Académie royale des inscriptions et belles-lettres, avec les mémoires de Littérature tirés de Registres de cette Académie, depuis l’année M.DCCLXX, jusques & compris l’année M.DCCLXXII, Tome 38 (Paris: L’Imprimerie Royale, 1778), 545: “L’Histoire, ainsi que la Nature, nous offre souvent une un amas de faits isolés & stériles: elle nous en présente aussi quelquefois de plus précieux , mais en petit nombre, d’où sort, comme une source féconde, un grand nombre de vérités.” This quote also appears in Kisacky, “History and Science,” 278. Much of my understanding of Le Roy’s views comes from this article. Eusebius of Caesarea, Praeparatio Evangelica (Preparation for the Gospel). E.H. Gifford, trans. (1903) -- Book 1, http://www.tertullian.org/fathers/eusebius_pe_01_book1.htm, Accessed 21 May 2011. Julien-David Le Roy, La marine des anciens peuples, expliquée et considerée par rapport aux lumieres qu’on en peut tirer pour perfectionner la Marine moderne (Paris, 1777), 12: “Des ouragans (dit Sanchoniaton) ayant fondu tout-à-coup sur des arbres de la forêt de Tyr, ils prirent feu, & la flammé dévora la forêt. Dans ce trouble, Ousoüs prit un tronc d'arbre, & l'ayant ébranchée, il osa la premier aller en mer.” (Italics mine). An excellent account of how other historians incorporated Sanchuniaton into their own accounts, see Edward Eigen, "The Plagiarism of Heathens Detected: John Wood, the Elder (1704-1754) on the Translation of Architecture and Empire, " Journal of the History of Ideas, Vol 70, No. 3 (Jul., 2009), 375-397. In this text, Eigen focuses on an English account of Sanchuniathon, Richard Cumberland, Sanchoniatho’s Phoenician History, translated from the first book of Eusebius De Praeparatione Evangelica (London: W.B. for R. Wilkin, 1720). Special thanks also go to Eigen for also pointing me to Cloué's articles about the Aden cyclone that are discussed later in this post. Bâtiment could refer to either a large or small vessel. Dictionnaire de l'Académie française, 4th Edition (1762), http://artflx.uchicago.edu/cgi-bin/dicos/pubdico1look.pl?strippedhw=b%C3%A2timent, Accessed 22 May 2011. However, in Diderot’s and D’Alembert’s Encyclopedie, the authors take great pains to distinguish between buildings and ships, creating a separate category for bâtimens (“buildings”), bâtimens de marine (naval buildings such as arsenals), and bâtiment marine (“ships”). L’Encyclopedie, Volume II (1752), http://fr.wikisource.org/wiki/L%E2%80%99Encyclop%C3%A9die/Volume_2#BATIMENT, Accessed 22 May 2011. For more on Le Roy’s work for the French Navy, see: Kisacky, “History and Science,” 278-280; Robin Middleton, “Introduction,” in Julien-David Le Roy, The Ruins of the Most Beautiful of Greece, Historically and Architecturally Considered, 130; and Sylviane Llinares, “Marine et anticomanie au xviiie siècle: les avatars de l’archéologie expérimentale en vraie grandeur,” Annales de Bretagne et des pays de l’Ouest, Vol. 2, No. 115-2 (2008), 67-84. Le Roy, Lettres à M. Franklin: sur la marine, et particuliérement sur la possibilité de rendre Paris port; précédés de recherches sur les moyens d'y prévenir la disette des grains (Paris, 1790). Le Roy, Nouvelles recherches sur le vaisseau long des anciens, sur les voiles latines, et sur les moyens de diminuer les dangers que courent les navigateurs (Paris, 1786). This text also details some of his correspondence with Franklin; Le Roy, Canaux de la Manche, indiqués pour ouvrir a Paris deux débouchés a la mer (Paris: Stoupe, 1801). This account is taken from Ivan Ray Tannehill, Hurricanes: Their Nature and History: Particularly Those of the West Indies and the Southern Coasts of the United States (Princeton: Princeton University Press, 1945). Vice-Admiral Georges Charles Cloué, “L’Ouragan de juin 1885, dans le Golfe d’Aden,” in Service Hydrographique de la Marine, Annales hydrographiques: Recueil d’avis, instructions, documents et mémoires relatifs à l’hydrographie et la navigation, Vol. 2, No. 8 (Paris: Imprimerie Nationale, 1886), 44. The first version appeared in the April 1886 issue of Revue maritime et coloniale; the second as Cloué, “L’Ouragan de juin 1885 dans le Golfe d’Aden (second mémoire)” Revue maritime et coloniale, Vol. 93 (Paris: Librarie Militaire de L. Badouin et cie, 1887), 177-214. The Coriolis effect is named after the French mathematician Gaspard-Gustave de Coriolis (1792-1843), who outlined the contours of this theory in Coriolis, “Mémoire sur les équations du mouvement relatif des systèmes de corps,” Journal de l'Ecole royale polytechnique, Vol. 15, No. 24 (1835), 142-154. 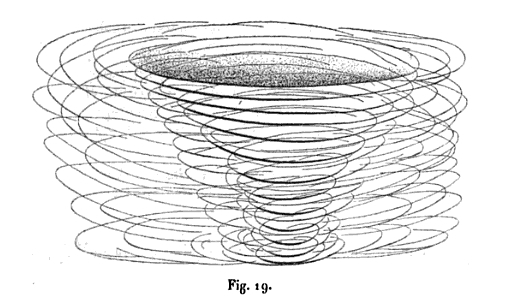 For more on Bertand’s erroneous calcuations, see Anders O. Persson, “The Coriolis Effect: Four Centuries of Conflict Between Common Sense and Mathematics: Part 1: A History to 1885,” History of Meteorology, Vol. 2 (2005), 1-24. Cloué, “L’Ouragan de juin 1885, dans le Golfe d’Aden,” 103: “La masse de nuages orageux se consommant sans se renouveler, l'ouragan a peut-être pris fin comme une simple trombe?” This quote also appears in David Membery, “Monsoon Tropical Cyclones: Part 2,” Weather, Vol. 57, No. 7 (Jul., 2002), 248. For more on "lines of force," see Michael Faraday, Experimental Researches in Electricity (London: Taylor, 1839). For more about the relation between precision and meteorology in 19th century Germany, see Theodore S. Feldman, “Late Enlightenment Meteorology,” in Tore Frängsmayr, J.L. Heilbron, and Robin E. Rider, eds. The Quantifying Spirit in the Eighteenth Century (Berkeley: University of California Press, 1990), 143-177. Here, Feldman argues how political events of the late 18th century interrupted the project of quantifying weather. This would set the stage for the more systemic, “globalist” approaches to meteorology perfected by Alexander von Humboldt. Focusing on the work of German physicist and meteorologist H.W. Dove, M. Norton Wise situates the desire to quantify weather within a larger series of contexts, including not only relations between scientists and an emerging maufacturing sector, but also the advent of locomotive and wireless technologies. Wise, “Precision: Agent of Unity and Product of Agreement Part II—The Age of Steam and Telegraphy,” in Wise, ed., The Values of Precision (Princeton: Princeton University Press, 1997), 222-238. Paul Saenger, Space Between Words: The Origins of Silent Reading (Stanford: Stanford University Press, 2000), 69. Erwin Panofsky, Perspective as Symbolic Form, Christopher S. Wood, trans. (New York, New York: Zone Books, 1997), 27 (translation of "Die Perspektive als 'symbolische Form'," in Vorträge der Bibliothek Warburg, 1924-1925 ). Voltaire (François-Marie Arouet), Candide, or Optimism (New York: Bantam, 2003 ), 26. John Ruskin, The Storm-Cloud of the Nineteenth Century: Two Lectures Delivered at the London Institution, February 4th and 11th 1884 (Sunnyside, Orfington, Kent: George Allen, 1884), 43-44, 47-48. Robert Musil, The Man Without Qualities, Part I: A Sort of Introduction and Pseudoreality Prevails into the Millenium, Sophie Wilkins, trans. (New York: Knopf, 1995), 3. I immensely enjoy your site. This is some of the best-quality blogging I've seen on the internet. I have added you to my blogroll. You might find some of the content of my own blog interesting. I have compiled, digitized, and uploaded a number of early Soviet avant-garde journals onto my site, which include high-quality illustrations and searchable text.